It's Just Mobolaji | Music & Entertainment: Event: iLUVLIVE 10th Birthday with Naughty Boy, Emeli Sandé, Rough Copy, Jacob Banks & More! + COMPETITION! 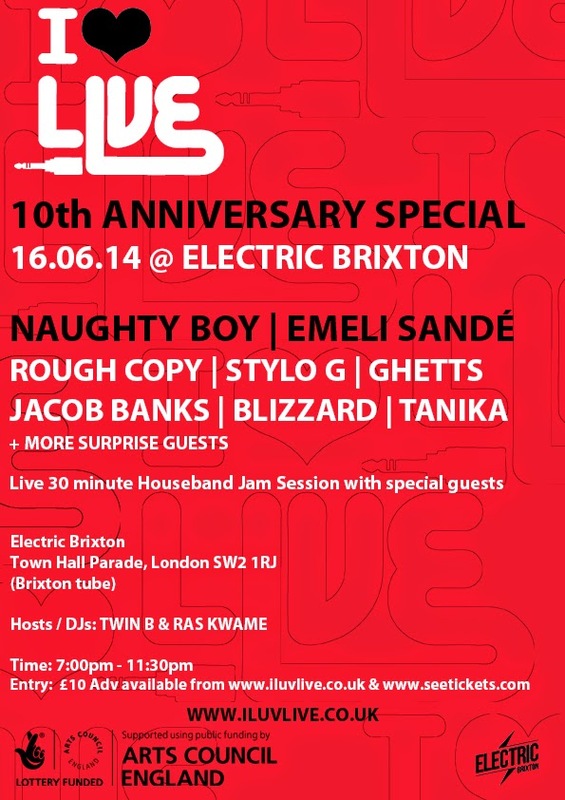 Event: iLUVLIVE 10th Birthday with Naughty Boy, Emeli Sandé, Rough Copy, Jacob Banks & More! + COMPETITION! It's always exciting to see or hear about what the good people over at ILUVLIVE are up to, and on June 16th they're celebrating their ten years as the UK's leading home grown live music event. To celebrate Naughty Boy and Emeli Sandé are back to perform some of their favourite tracks together. Emeli has taken to the ILUVLIVE stage twice before she got signed and was where she had first met Naughty Boy, which secured both of their futures. Speaking on ILUVLIVE, Emeli said: "iluvlive was a great opportunity for me. It's where I met Naughty Boy which led me to featuring on tracks with artists like Chip and Wiley." The night will see support from some of the UK's hottest emerging acts such as Rough Copy, Stylo G, Ghetts, Jacob Banks, Blizzard, Tanika plus special guests. With the night ending with a thirty minute live jam session with the infamous ILUVLIVE house band and will see the likes of Terri Walker, GFrsh, Little Simz, Jamie Joseph, Lady Leshurr, Lady Lykez, Nick Brewer, Moelogo and still more to be announced surprise guests. Sounds like a night NOT to be missed! And to make it even more exciting, I'll be running a competition giving away TWO tickets to ONE lucky person, further details about the competition and the event can be seen below. PLEASE NOTE THAT THIS IS AN OVER 14's EVENT. UNDER 1'S MUST BE ACCOMPANIED BY AN ADULT. MAX TWO UNDER 18's PER ADULT. Interested in attending the ILUVLIVE event, and want to win a pair of tickets? Simply send an email to: itsjustmobolaji@gmail.com with your full name with the subject line ;ILUVLIVE Competition'. Winner will be picked at random and competition closes on Friday, 13 June, 2014 at 12noon.